There are no green input or output connectors in the header, because this building block is never explicitly executed. Rather, it is used to perform a calculation on position values and deliver the result to other building blocks. 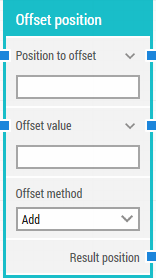 The title of the block (“Offset position”) can be changed by double-clicking on it and typing in a new title. The position to offset in X, Y coordinates. The top-left corner of the screen is position 0, 0. Click the expander button to work with the X and Y coordinates separately. The position to offset the original position with in X, Y coordinates. The top-left corner of the screen is position 0, 0. The method to use during offset (add or multiply). For instance, adding 10, 20 to a position 500, 500 results in a position 510, 520. The resulting position from the offset operation in X, Y coordinates. The top-left corner of the screen is position 0, 0.